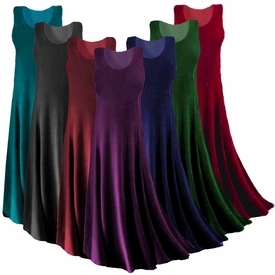 This is a very lovely plus size & supersize a-line or princess cut slinky tank dress (or top!) now available in many colors! It has a medium round neckline, no sleeves, is available in several lengths, and has a wonderful drape! This material never wrinkles, and it hangs like a dream!